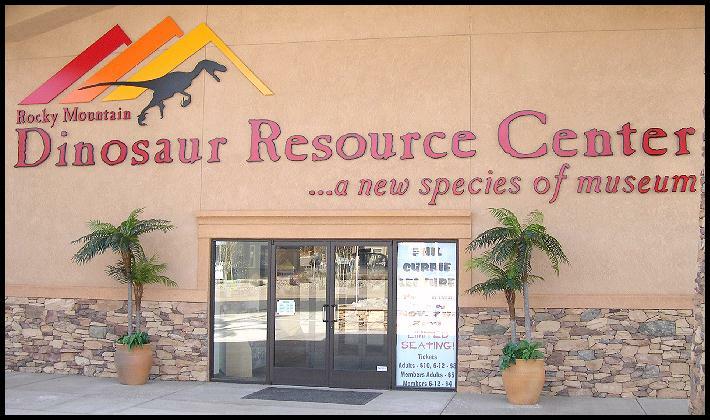 The Rocky Mountain Dinosaur Resource Center (RMDRC) in Woodland Park, Colorado is a new museum of natural history that opened it's doors for the first time in 2004. Information regarding the location, admissions, operating hours, etc. can be found on the the RMDRC webpage HERE. Located in the mountains about 15 miles west of Colorado Springs, Woodland Park is a great place to visit just for the mountain scenery outside the RMDRC museum. Inside, however, the exhibits are are unique and in many cases, unlike those found in any other museum that I am aware of. 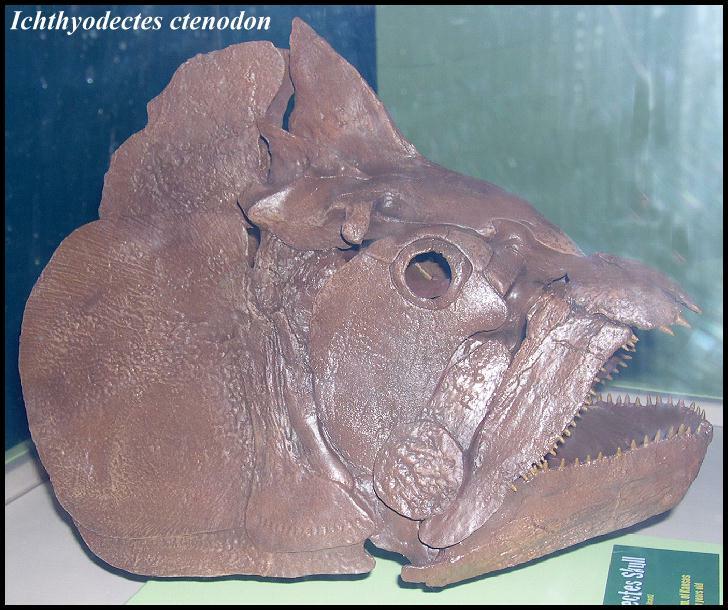 The name, of course, implies that they have lots of dinosaur exhibits, which they do... but they also have some of the best examples of marine creatures from the Late Cretaceous Western Interior Sea that you would be able to see anywhere. 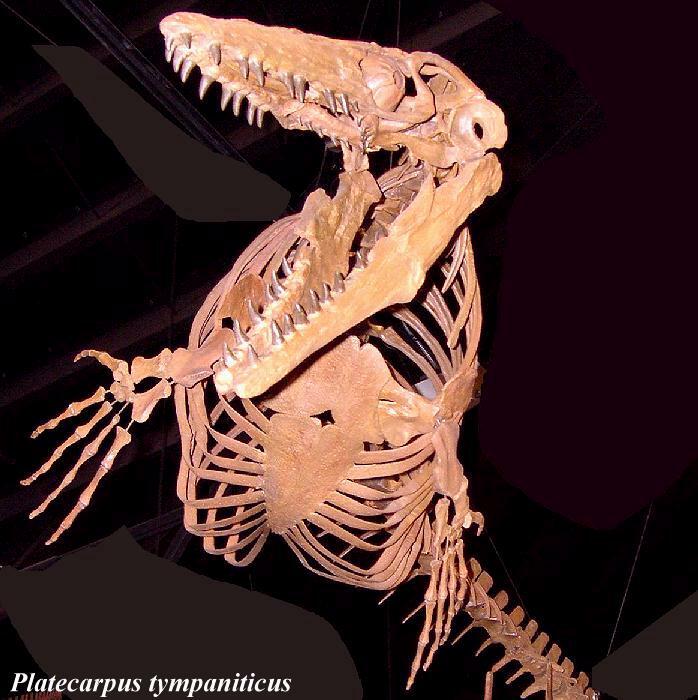 The pictures below were taken during my first visit to the museum in November, 2004, and a subsequent visit in February, 2006 (Plesiosaur Symposium). The marine exhibits at the RMDRC are a mixture of actual fossils and three-dimensional casts made from fossil specimens. 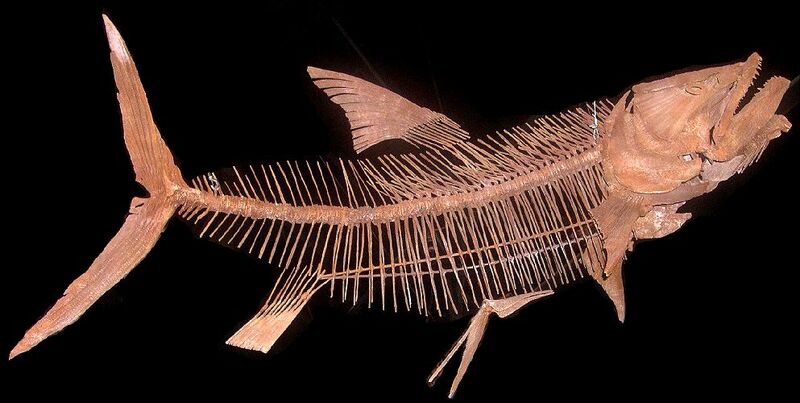 One of their areas of expertise is assembling fossil skeletons, whether they are dinosaurs, marine reptiles, or giant fish, into realistic 3-dimensional poses that can be enjoyed by the public and studied by scientists. 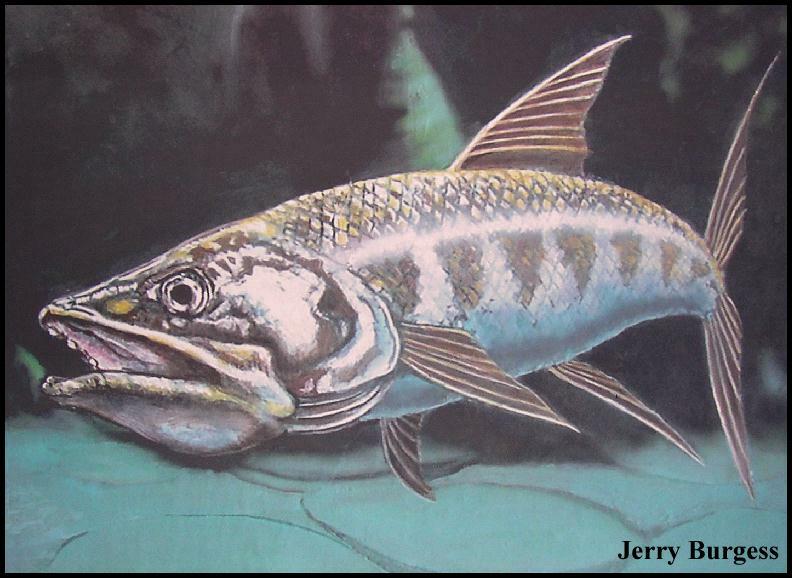 These exhibits include the largest mounted mosasaur skeleton in the United States (probably in the world) and a tiny fish that was found preserved inside a clamshell.... and lots of things in between. LEFT: The Bunker Mosasaur... a huge, 40 foot long Tylosaurus proriger collected from the Pierre Shale near Sharon Springs, in Wallace Co., Kansas, by Professor Bunker of the University of Kansas about 1911. RIGHT: A tiny (3 inch) fish called Kansius sternbergi that died inside a giant clam (Platyceramus platinus) - Smoky Hill Chalk, Gove County, Kansas. 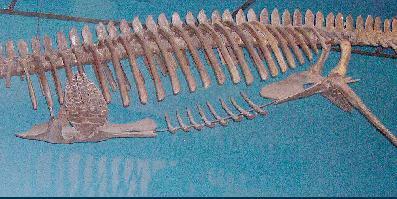 Many specimens in the museum, included the Bunker mosasaur (above) are simply too long to be captured in a single picture. 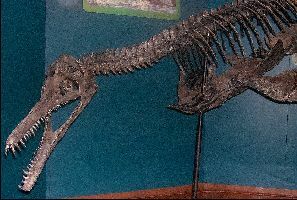 This includes the cast of the skeleton of Elasmosaurus platyurus, found in Kansas in 1867, and now housed in the Academy of Natural Sciences of Philadelphia. 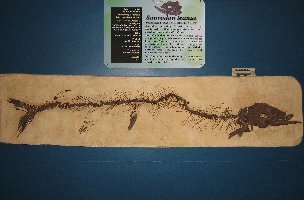 Few people realize that Elasmosaurus platyurus is from the Pierre Shale western Kansas (Logan County) and is the only known example of the species. 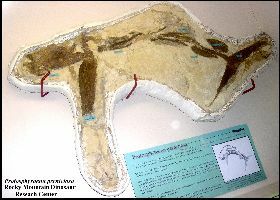 LEFT: The head and part of the neck of Elasmosaurus platyurus. 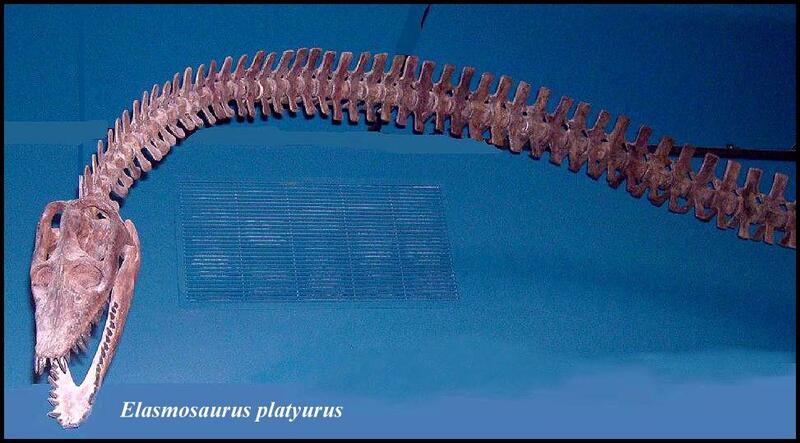 The neck of this plesiosaur is about 20 feet in length or about one-half the length of the entire animal. It has 72 vertebrae. The skull is only about 20 inches long. 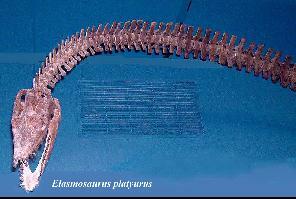 RIGHT: The body of Elasmosaurus platyurus was rigidly constructed, with ribs, gastralia and limb girdles creating a sort of internal shell. LEFT: A 3-D mounting of a large Dolichorhynchops bonneri. 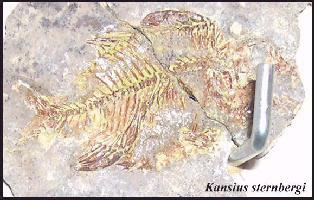 This specimen was collected by the University of Kansas in the 1970s from the Pierre Shale of South Dakota. RIGHT: The skull of the KUVP 40001 Dolichorhynchops bonneri as mounted in the RMDRC exhibit. 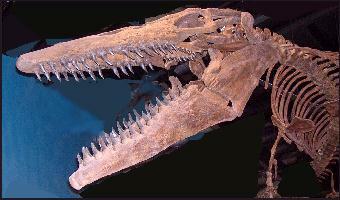 There are several other 3-D mosasaur skeletons on exhibit as well as the bones of at least three other specimens. Mosasaurs were very successful predators that roamed the oceans of the world during the last 25 million years of the Late Cretaceous. Some of the best known specimens have been found in the Smoky Hill Chalk of Kansas. 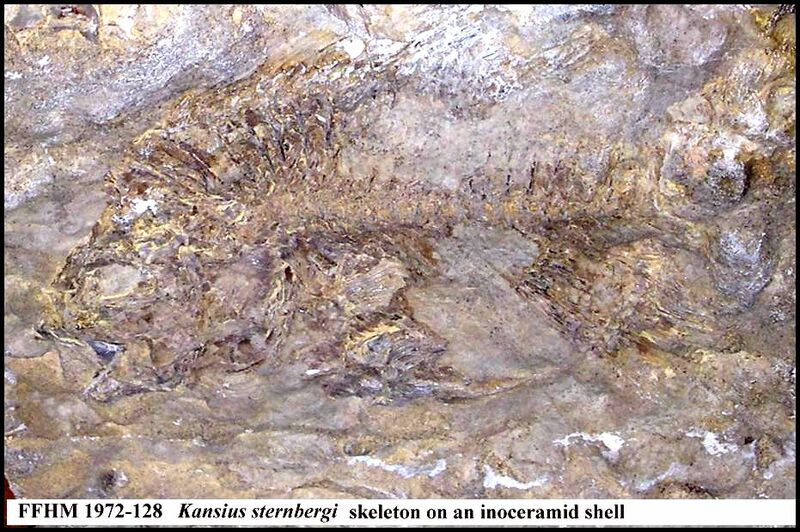 Mosasaurs have been collected from Kansas since about 1868 when the first specimen of Tylosaurus proriger was obtained from near Monument Rocks by Louis Agassiz for the Harvard Museum. It was later described by E. D. Cope. 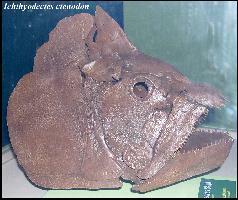 LEFT: A head-on, toothy view of an attacking Platecarpus tympaniticus (about 20 feet long). Mosasaurs would have kept their jaws tightly closed until they grabbed their prey. RIGHT: A very unusual way to look at a mosasaur. 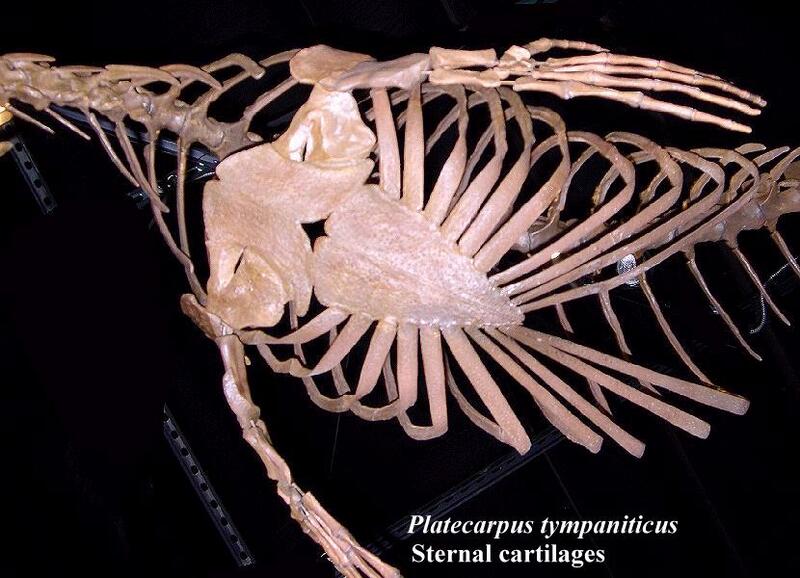 This view shows the chest of the same Platecarpus tympaniticus specimen from below and reveals what is probably the best reconstruction of the cartilaginous sternum and ribs that I have ever seen. 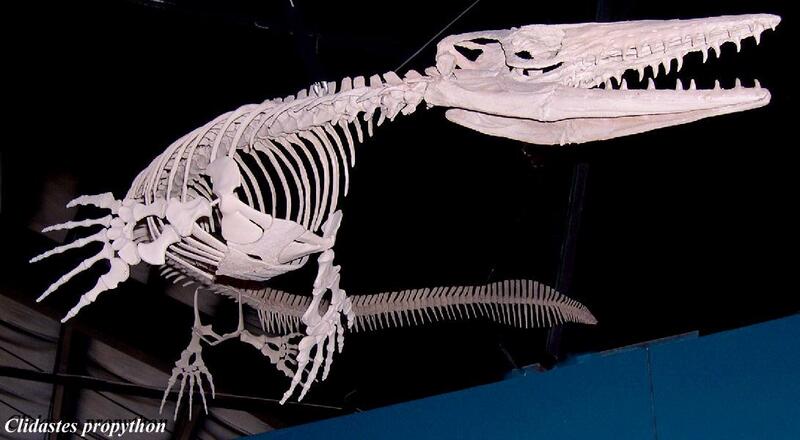 Much of a mosasaur's skeleton was composed of cartilage and low density bone because heavy, stiff bone was not required for life underwater. LEFT: A reconstruction of one of the smaller mosasaurs in the Western Interior Sea: Clidastes propython. Generally less than 12 ft. long, some individuals reached 20 ft. RIGHT: The skull of the Clidastes propython shown at left. 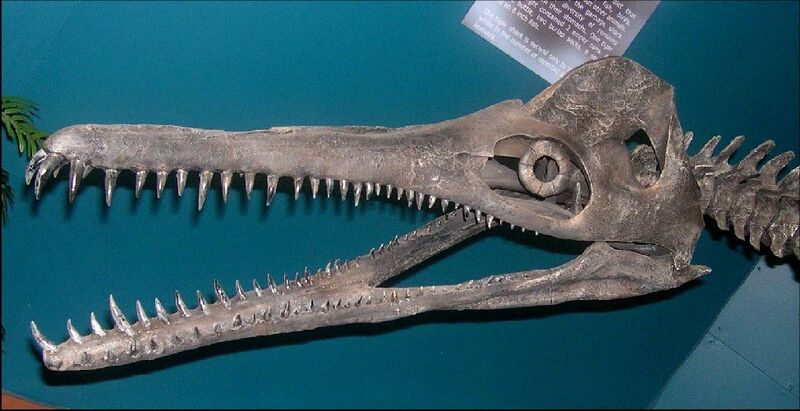 The RMDRC has several 3-D mosasaur skulls on display, including a 5 1/2 ft. long Tylosaurus proriger, Platecarpus tympaniticus, Platecarpus planifrons and Clidastes propython. 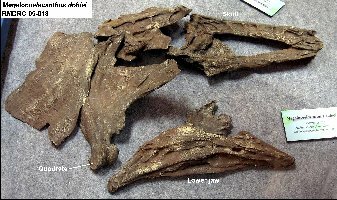 LEFT: This section of the tail (caudal) vertebrae of a newly discovered and very complete specimen of Tylosaurus is on display outside of the preparation facility at the RMDRC. The bones are still held in the plaster and burlap jacket that protected them after removal from the dig site. Note the 'chevron bones' are not fused to the lower side of the vertebrae. 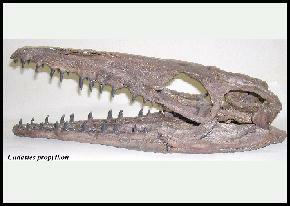 This is a characteristic used in identifying both Tylosaurus and Platecarpus. 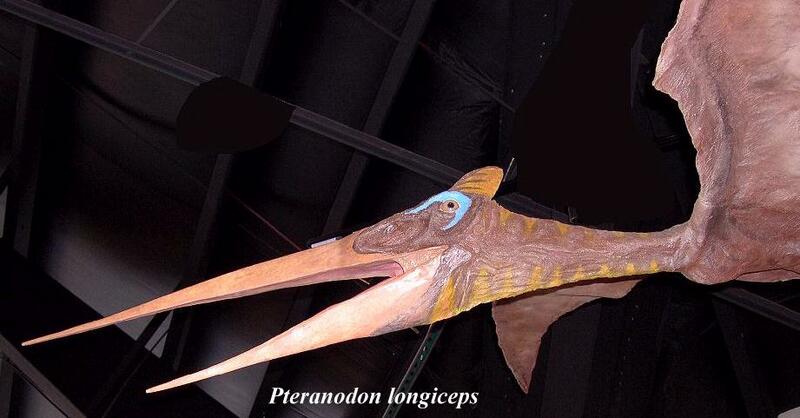 The western Interior Sea was also the home and feeding grounds of large, toothless flying reptiles called pteranodons. First discovered by O. C. Marsh in 1871, these giant flying reptiles were capable of flying long distances (hundreds of miles) over the ocean in search of food. 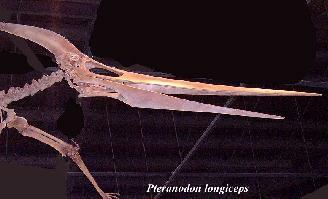 LEFT: A reconstructed skeleton of a large, male Pteranodon longiceps from the Smoky Hill Chalk. 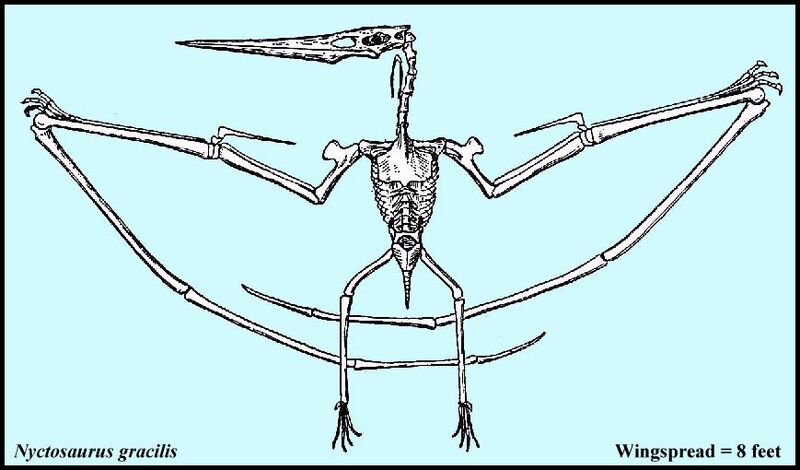 This flying reptile had a maximum wing spread of about 25 feet. 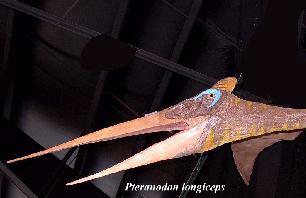 RIGHT: A "flesh-on-the-bones" reconstruction of a smaller female Pteranodon longiceps. 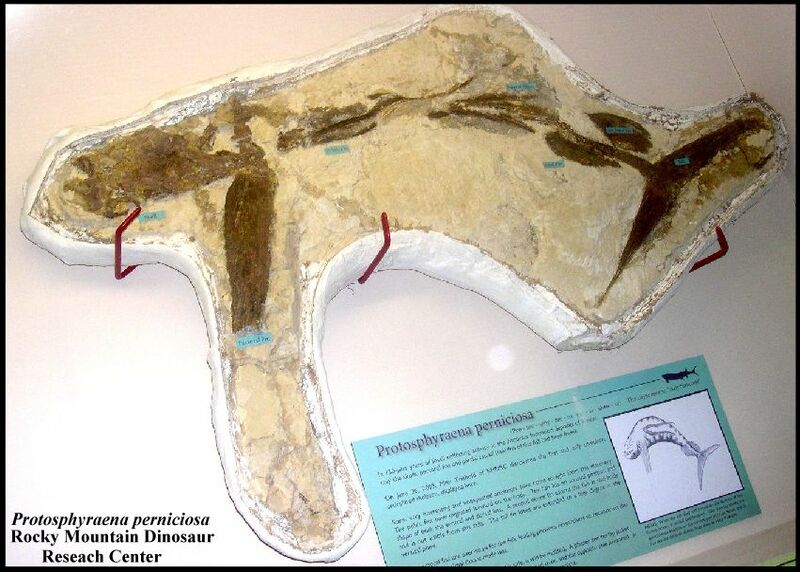 Pteranodons shared the air over the Western Interior Sea with a smaller pterosaur called Nyctosaurus and even smaller, toothed birds called Ichthyornis. 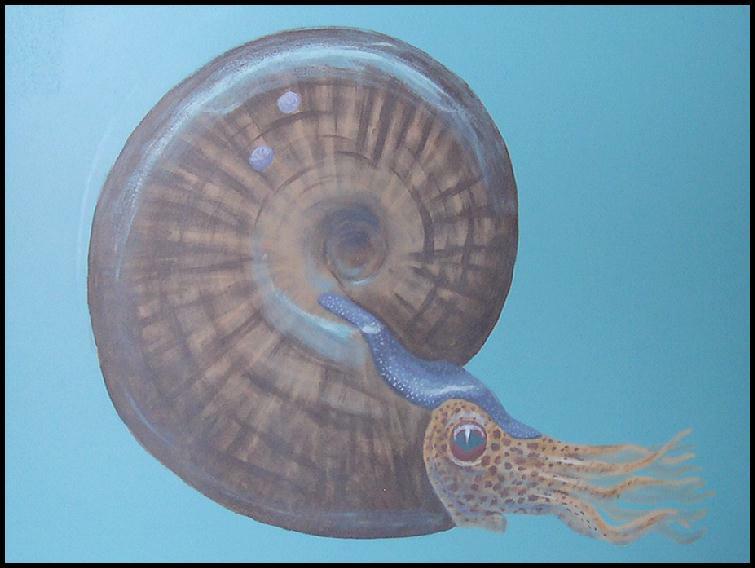 The ocean was filled with many kinds of fish, and invertebrates like ammonites and squid. 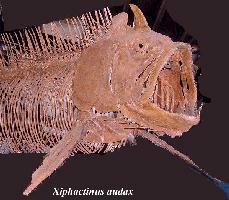 The largest of the fish was a giant ichthyodectid called Xiphactinus audax. 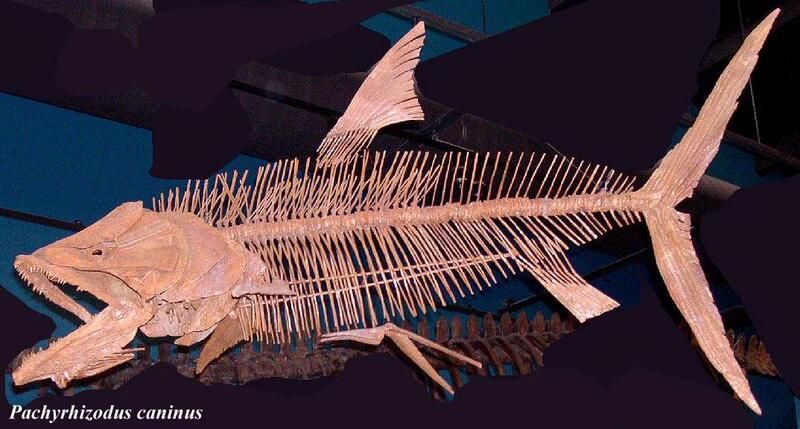 The RMDRC has a mounted skeleton of a 17 foot long Xiphactinus, one of the largest ever found. Other fish, such as Ichthyodectes and Pachyrhizodus were somewhat smaller but fearsome predators in their own right. LEFT: A head-on view of a giant Xiphactinus audax that hangs overhead in the ancient seas portion of the RMDRC museum. Another view of this outstanding reconstruction is HERE. 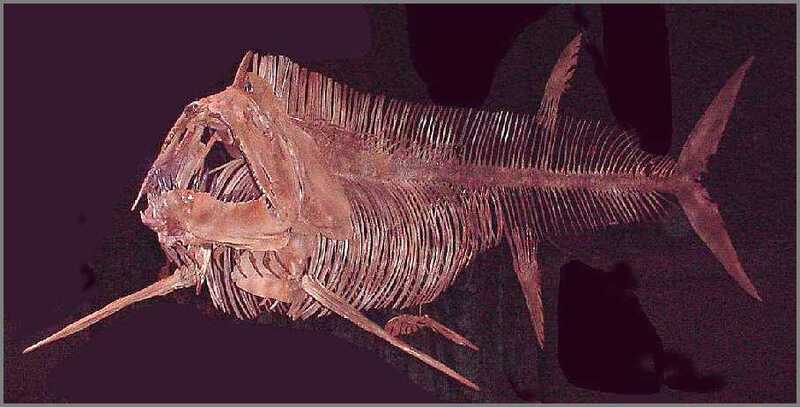 Xiphactinus is often found with the remains of its last meal preserved as stomach contents, like the famous Fish in a Fish collected by George Sternberg. 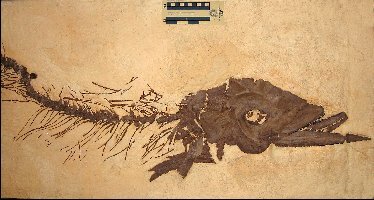 This much larger specimen also had the remains of a Gillicus in its stomach. 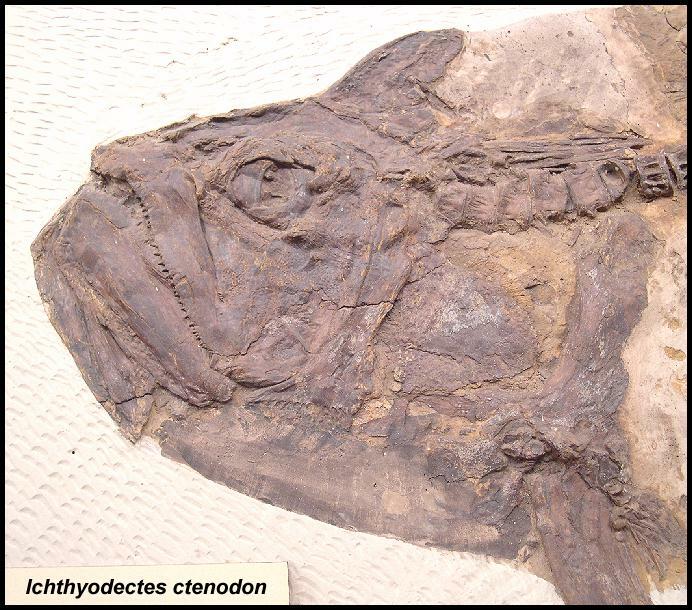 RIGHT: The reconstructed skull of another large ichthyodectid, Ichthyodectes ctenodon, also from the Smoky Hill Chalk. This species probably reached lengths of 8-10 feet. RIGHT: A close up of the same specimen, showing the characteristic spike (predentary) on the lower jaw. Scale bar is 10 cm - about 4 inches. Specimen is over 7 feet long. RIGHT: A painting of Pachyrhizodus caninus by Jerry Burgess at the RMDRC museum. 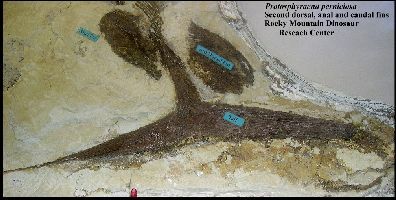 LEFT: This is the most complete specimen of Protosphyraena perniciosa ever found. It was collected from the Smoky Hill Chalk of Gove County, KS. 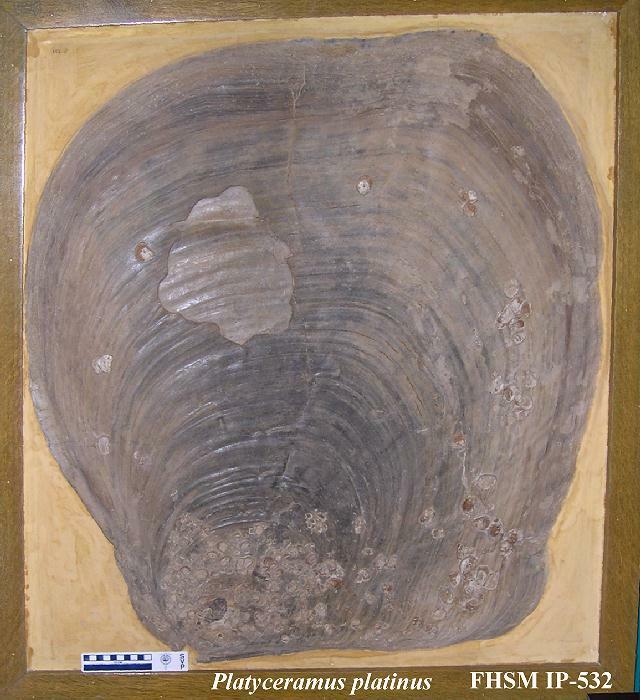 RIGHT: The tail of the recently discovered Protosphyraena perniciosa specimen. 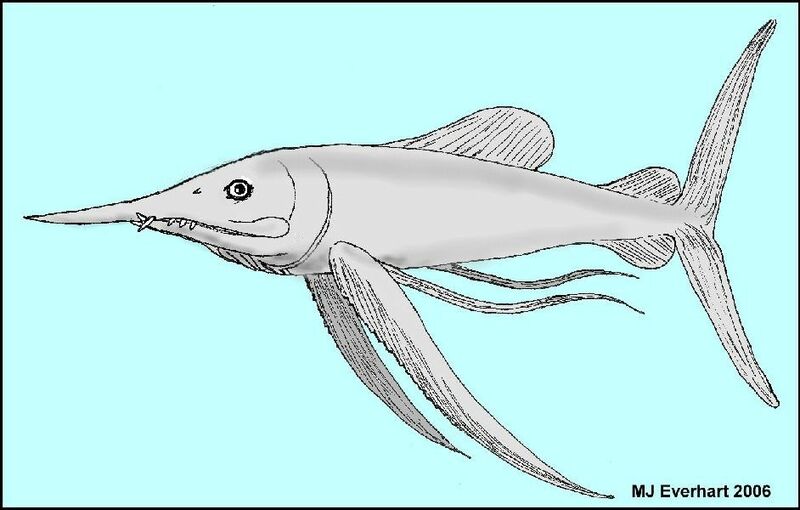 An updated version of what this strange fish might look like is found on my Protosphyraena page. 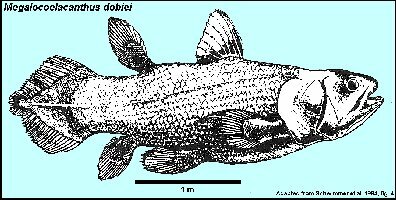 Recent discoveries of the remains of a giant coelacanth in the Smoky Hill Chalk of western Kansas have been assigned to a genus and species (Megalocoelacanthus dobiei) first reported from Alabama by Schwimmer et al. in 1994. The latest report by Dutel et al (2011) describes a fairly complete and well preserved skull in the collection of the American Museum of Natural History. 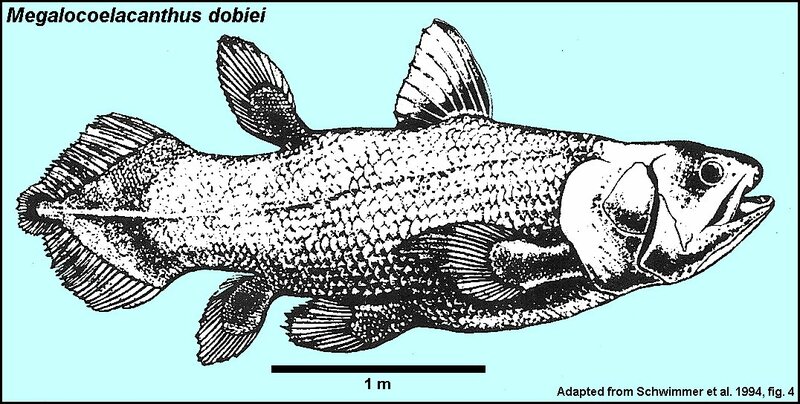 LEFT: A reconstruction of Megalocoelacanthus dobiei adapted from Schwimmer et al. 1994. 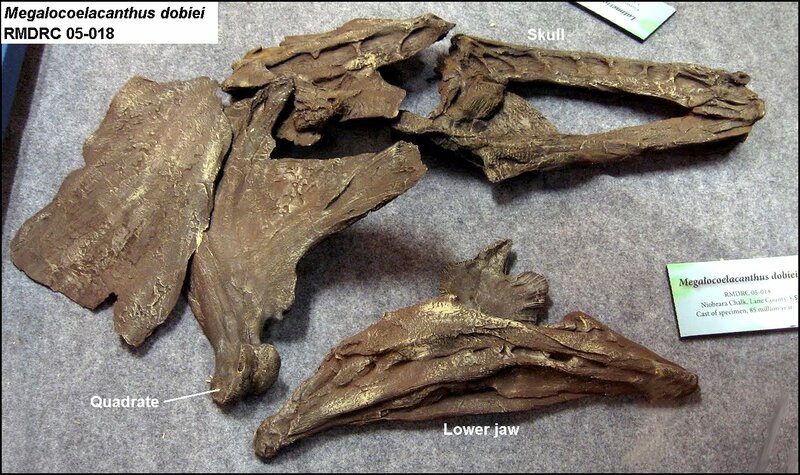 RIGHT: A partial skull of Megalocoelacanthus dobiei (RMDRC 05-018) from the Smoky Hill Chalk of Lane County, Kansas. 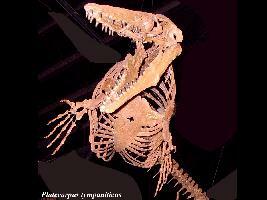 Photo adapted from the Rocky Mountain Dinosaur Resource Center Blogspot. This is only a small portion of the exhibits at the Rocky Mountain Dinosaur Resource Center. Their collection is growing and new exhibits are being added. Some of the specimens currently being prepared have never been seen before. It is certainly well worth a visit.